WhatTheyThink was the only media partner of the 70th annual TAGA Technical Conference that took place in Baltimore earlier this month. TAGA is the Technical Association of the Graphic Arts. I thought it would be appropriate to actually cover the event. This book is a time capsule. It details the development of offset lithography and other printing methods in the 20th century. It also documents the life of a unique person, Michael H. Bruno. His degree in Chemistry from Yale University helped spark a life-long interest in printing. His World War II service involved map reproduction. After the War, he found his calling in printing research and education. He authored research papers, books, newsletters, and special technical reports. He and his fellow researchers advanced offset lithography to become a viable printing process. 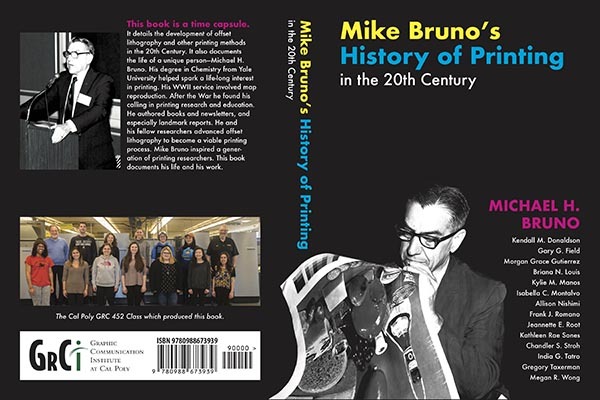 Mike Bruno inspired a generation of printing researchers. This book documents his life and his work. If you go through the 70 years of proceedings, you will see that much of the research presented at TAGA evolved into actual products. It’s the only general conference that shares technical research. Mike Bruno would be happy to see that it still continues. The 2018 TAGA Conference had more than 30 technical sessions covering almost every aspect of print technology. Speakers included academics, suppliers, students, and other researchers, foreign and domestic. Dr. Joe Webb was the first keynote speaker. The event got off to a good start in spite of it. The 2018 recipient of the Michael H. Bruno TAGA Award was Mark Bohan, now of Heidelberg, but with a lifetime of research under his belt. Another important aspect of TAGA is student involvement and the role TAGA plays in helping to groom the next generation of print professionals. This includes the student chapter journal competition. The student journals highlight student research at their schools, presented in creative designs that showcase their printing prowess by incorporating value-added production techniques. See the video of the seven RIT students who created a journal that incorporated artificial reality. I ran into old friends and made new ones. I gleaned new knowledge from most of the presentations. It’s a shame that other media do not cover this important event. You can help by donating to the schools above to fund student project development and their travel to the event. It will be held in Minneapolis in March, 2019. Papers accepted and presented are published in the TAGA Proceedings, which is recognized worldwide as the most prestigious and comprehensive literature resource for graphic arts sciences and technologies. Each is a time capsule that records the inevitable path forward for the graphic arts industries. "Dr. Joe Webb was the first keynote speaker. The event got off to a good start in spite of it." It was my first TAGA meeting -- EVER! And in light of my announced plans, there is a good chance it will be my last. Meeting the students was marvelous. We had a good time -- there is talent in our programs, for sure, and they have an innate sense of multi-media as users, so their interest in print has a context that is needed by our print organizations. And your comment about "running into old friends," PLEASE be careful, first of all, at your age you shouldn't be running... and then with all those people you ran into, I had to help all all of them up!